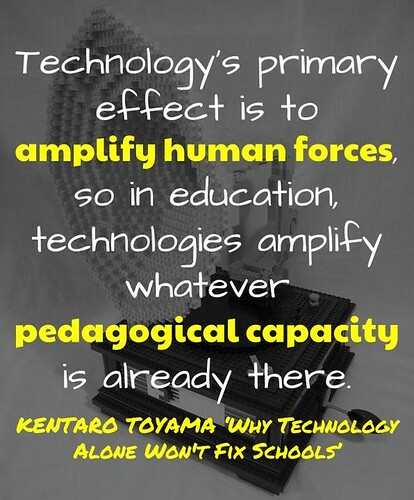 In this extract from Geek Heresy published in The Atlantic, Kentaro Toyama makes that point that technology merely amplifes pre-existenting pedagogical capacity and only emphasises differences in wealth and achievement. 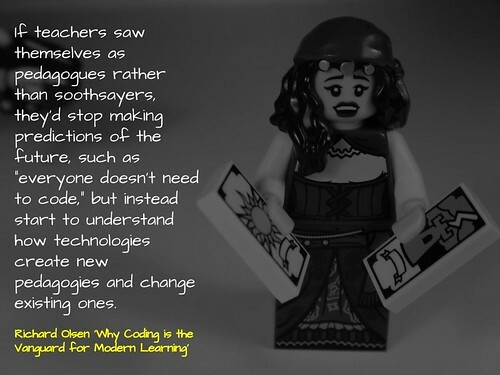 In a response to the debate about coding, Richard Olsen makes an attempt reposition the way we see coding and why it truly matters. I wrote a response here. 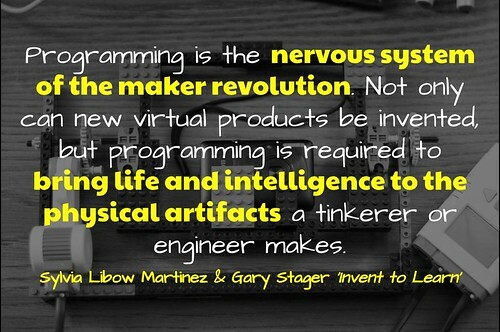 In their book Invent to Learn, Sylvia Libow Martinez and Gary Stager unpack everything from Project Based Learning, to Reggio Emilia, to makerspaces, to coding, all with the focus on learning through the act of making. In her post in the Atlantic, Alexandra Samuel argues that there are three distinct styles of digital parenting: limiters, mentors and enablers. 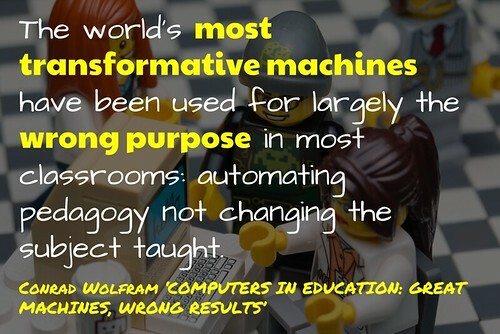 I wrote a post wondering if the same distinctions could be applied to teachers. 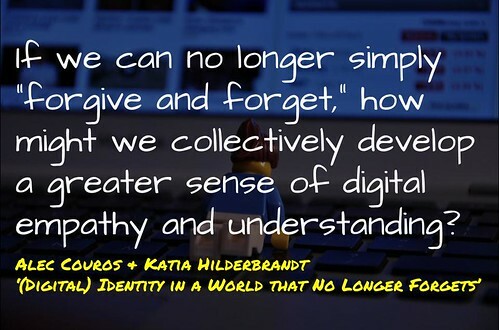 In this post, Alec Couros and Katia Hilderbrandt ask the wicked question about life when we are no longer able to forget. There answer, empathy. 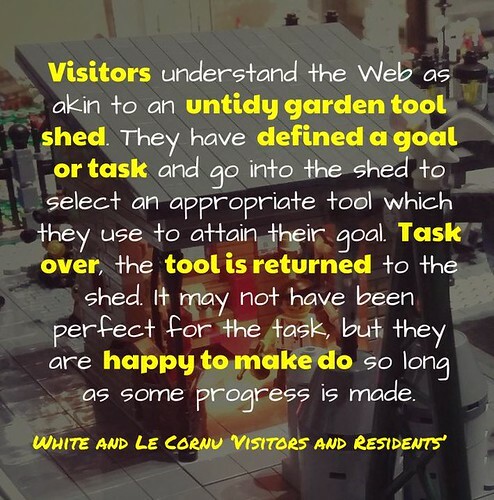 In response to Marc Prensky’s notion of native verses immigrant, David White and Alison Le Cornu put forward an alternative with the idea of visitors and residents. A central figure behind Wolfram Alpha and Wolfram Mathworld, Conrad Wolfram questions the way we use technology. 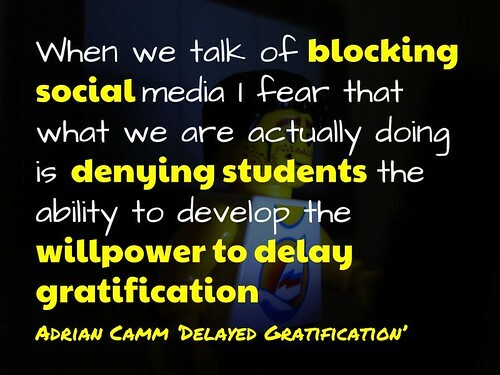 A continual inspiration in regards to play and experiential learning, Adrian Camm highlights the importance of developing resilience and moderation, rather simply banning devices like Sydney Grammar. 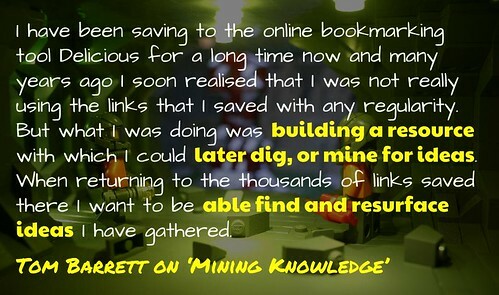 In this post exploring creativity, Tom Barrett provides an explanation for social bookmarking as a means of resurfacing ideas. 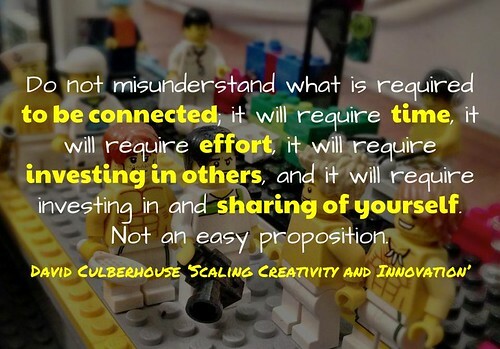 In his book exploring the idea of creativity and innovation, David Culberhouse outlines the challenges associated with being a connected educator. Along with The Changing Face of Modern Leadership, Culberhouse’s books are a useful resource for addressing education in an ever connected world. Along with Robin Good’s post, Heather Baille’s essay offers an excellent discussion of all things curation and its place within education. 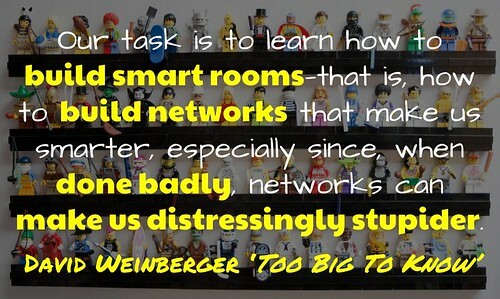 In the book that produced the saying that the smartest person in the room is the room, David Weinberger provides the warning that being in the room is not enough. It is what you do that actually matters. In his book on the modern world, David Price coined the notion of ‘SOFT’. 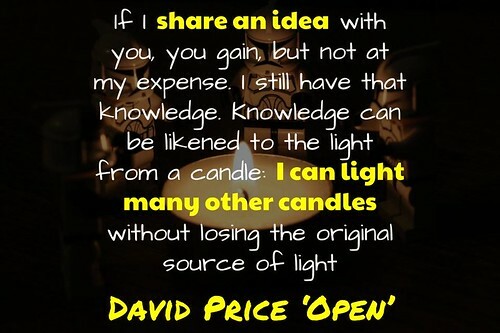 Central to this is the power of sharing. 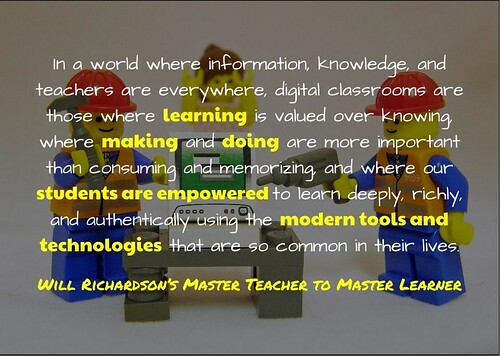 In his book From Master Teacher to Master Learner, Will Richardson provides an outline for what is required with modern learning. 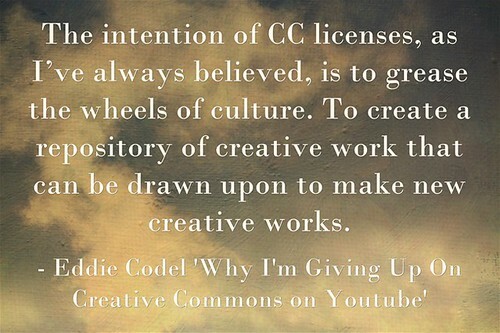 In a post aimed at Youtube’s confusing CC licences, Eddie Kai highlights the purpose of such licences and where this has gone wrong. In an article exploring modern employability skills, Thomas Friedman explains what you need to do to get a job at Google. In a response to Will Richardson’s post, Dean Shareski argues that what is needed is not revolution, but support for those already doing great things. 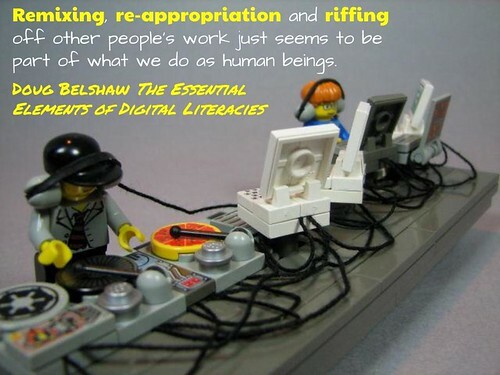 In the book summarising his work with digital literacies, Doug Belshaw addresses everything from what constitutes technology to how we actually define literacy. I wrote an extended response here. 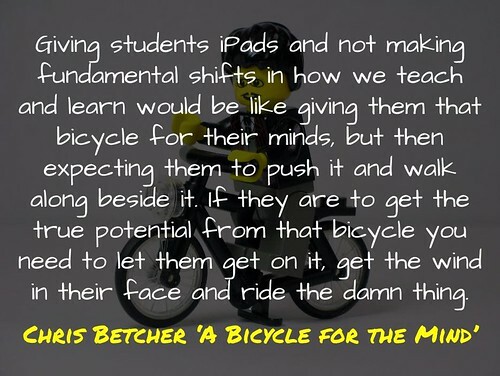 Reflecting on the place of iPads in teaching and learning, Chris Betcher makes the call to let students actually utilise technology. 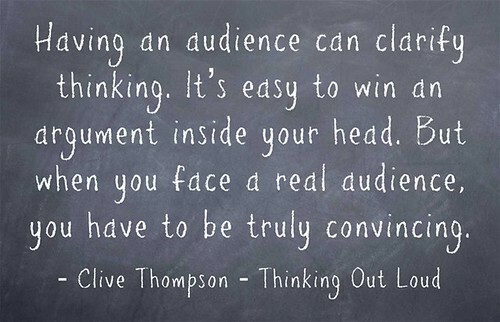 In an extract from his book Smarter Than You Think, Clive Thompson suggests that even the worst bloggers are making us smarter by working openly in the connection of different ideas. 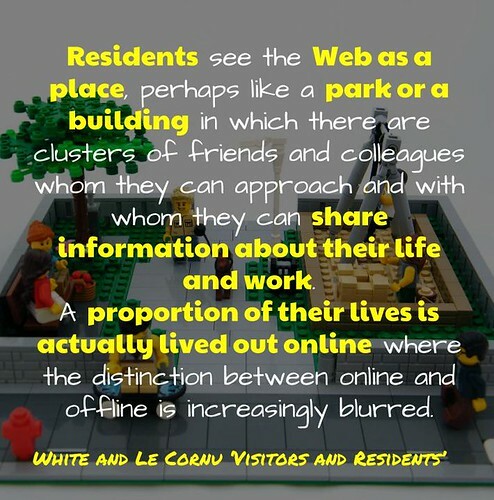 Like Adrian Camm, danah boyd argues that instead of worrying about locking teens into protected communities, rather our concern should be about integrating them constructively into the wider web. This is a message carried through her book It’s Complicated. 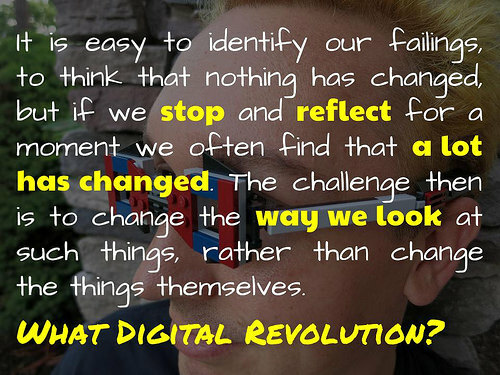 Although there is some dispute about the application of Kant’s transcendental principles, David Tuffley’s post provides an interesting take on digital citizenship. 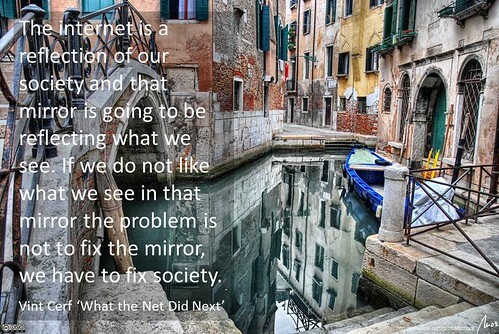 Taken from danah boyd’s book It’s Complicated, this quote from Vint Cerf sums up much of the challenge with technology, that it is how and why we use the internet that needs to be questioned. Here then is a collection of quotes that I have come upon. They may not be the most quotable, rather they are those moments that stood out to me as I read. 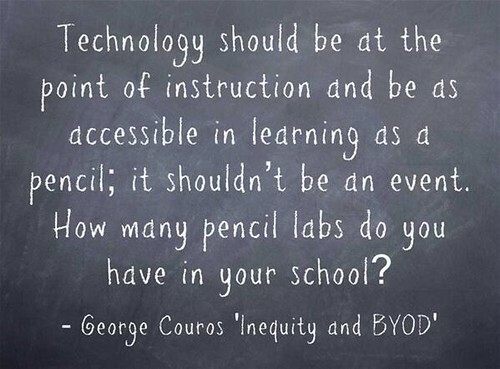 So what about you, what are some of the quotes you draw on to help stretch your understanding of technology. As always, comments welcome. 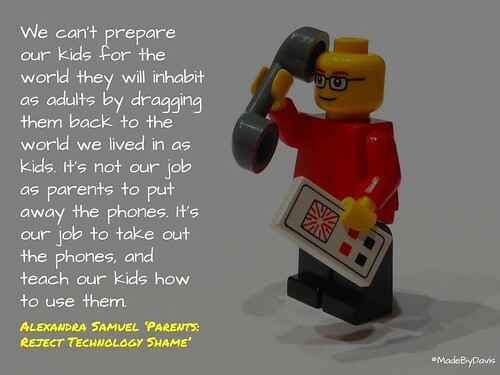 Quotes to Provoke Technology-inspired Teaching and Learning by Aaron Davis is licensed under a Creative Commons Attribution-ShareAlike 4.0 International License.